The X-Wall Secure Mobile Rack is a secure, portable and convenient solution combining the power of strong encryption with unprecedented throughput speed to protect sensitive data and credentials stored on PCs and servers. Accommodating any standard 3.5 inch hard drive, Enova®’s Secure Mobile Rack automatically and transparently encrypts all stored data and may be easily removed for safekeeping or for use in a different location. The sensitive nature of confidential information is driving the need to secure data stored on all portable computer systems. Enova®'s innovative solution ensures multi-level privacy, confidentiality and authentication, allowing organizations to protect valuable assets, credentials and intellectual property which are exposed to significant risk of theft. Legal liability and the financial consequences associated with stolen confidential information require organizations to go to extreme lengths to protect their data. Certain inhibiting factors have limited the widespread adoption of data encryption. Software solutions fail to address multiple concerns of performance degradation, user acceptance and ease-of-use. In contrast, hardware-based encryption technology is a much more secure solution offering simple and absolute data security which completely eliminates processor cycle interrupts and memory overhead. With Enova®'s transparent hardware based solution you are assured that your data and credentials are fully protected. Enova®'s X-Wall solution completely eliminates the traditional trade-offs between speed, convenience and security. X-Wall performs automatic and transparent hardware based "real-time" encryption at an unprecedented 1.1 Gigabit (or more) per second, requiring no user intervention. This ensures users never experience any performance degradation, with systems functioning at exactly the same speed as before X-Wall was installed. The X-Wall Secure Key stores and protects the encryption key used by the X-Wall microchip to encrypt data. The correct X-Wall Secure Key must be inserted into the special key socket (present on X-Wall finished products) at system boot up to authenticate the user and authorize the operating system to load before granting access to data stored on the hard drive. Because X-Wall operates at the physical hardware layer, it is compatible with all Operating Systems and requires no specific device drivers. Software upgrades, patches and bug-fixes are therefore no longer relevant. X-Wall provides the complete security your data deserves. Utilizing only Government NIST approved DES and TDES algorithms for assured security, X-Wall also allows you to choose the encryption key strength that best suits your particular requirements. 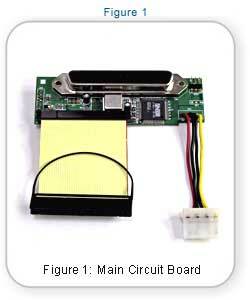 As illustrated in Figure 1, the Main Circuit Board of the Enova® Secure Mobile Rack, the standard 3.5" disk drive is connected via the provided IDE cable. The Enova® X-Wall SE chip encrypts every thing written to the hard drive at 1.1Gbit/sec. 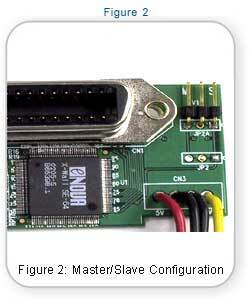 The Master/Slave jumper shown in Figure 2 allows you to select the mode of your disk drive. You must use the supplied Secure Key token to "initialize" the hard drive, i.e., to "FDISK" then "FORMAT." Make sure you back up the important disk content prior to initializing your disk drive. As X-Wall encrypts your boot sector and partition table and the rest of drive volume, your entire drive content will be associated with the specific key token you use. Therefore, at every power up or resume from hibernation, the correct key token must be applied. Without it, the X-Walled hard drive will not be able to boot as the process of decryption won't occur accurately. How to insert the key token? The key insert is provided via the front panel of the Secure Mobile Rack. You must present the same key token every time you restart the computer or resume from hibernation mode. You may remove the key token after the X-Walled drive has been properly recognized by your system. Enova® Technology, a privately held company with its HQ in Hsin-Chu Science Park, Taiwan, Republic of China, specializes in the design of advanced real-time cryptographic solutions. Enova®’s innovative encryption technology satisfies the needs of Corporations, Government Agencies, Consumers and security-conscious users worldwide who demand absolute privacy and confidentiality of stored data and network credentials.